We, Greenstone Design UK Ltd, are conscious that our activities will affect environmental consciousness, resources and the areas in which our designs are installed. At the same time, we acknowledge a healthy environment as vital for the future for sustainable landscape and interior design and recognise there is no future unless environmental values are central to all intervention policies. We are therefore committed to design and development according to the principles of environmental sustainability, in line with those set forth by the Bruntland Commission. Throughout all stages of training, design and build operations, we shall take due care to minimise the negative impacts on the environmental components: air, water, land, energy, natural resources, and ecosystems. Not only shall we operate in accordance with the relevant environmental laws; whenever possible, we shall also make use of innovative environmental management tools and processes. If we are to achieve our objectives, we require the assent and co-operation of all the public and private organisations involved. We shall therefore develop projects and initiatives with institutions in the UK and throughout the world, to improve the sustainability of communities, both built and natural. We shall promote these principles among all those who engage with us. However, our most ambitious goal is to leave an environmental legacy, once the builders have gone, characterised by best practice and sustainable technical solutions; in short, a new way of conceiving, planning and managing major and minor interior and landscape design projects that will set an example for future designers. In order to achieve this, we shall implement an environmental management system to be certified to ISO 14001 as proof of our commitment to promoting continuous improvements in terms of environmental management. Our results will be published each year in an 'environmental statement' that will be made available to all those concerned, as required by the EMAS (Regulation No. 761/2001/EC). 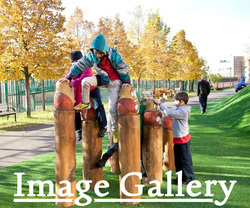 Greenstone Design UK Ltd will be delighted to help you design and project manage natural playgrounds, school grounds designs, BSF projects, Playbuilder, Pathfinder, community orchards, community allotments, rehab & sensory garden, sustainable home garden and sustainable interior design projects. Greenstone Design UK Ltd designs and builds sustainable communities through multi-generational inclusive public spaces, improving quality of life and the environment through design. Sustainable design ensures environmental and community enhancement through landscape design + project management.